Read the full text of the letter, and see all 100 pages of signatures from the 7,150 Catholic Sisters online at www.networklobby.org/2017sistersletter. Sister Simone Campbell, SSS and other Catholic Sisters are available for interviews. Quotes are available on the following pages. For inquiries, contact Ashley Wilson awilson@networklobby.org or 202-601-7856. “The mission of Catholic Sisters has always been to serve our nation’s most vulnerable people. As such, we are united in opposition to the current Republican healthcare proposals. Since this letter was circulated, Senate leadership has repeatedly changed course – from the BCRA, to a repeal of the Affordable Care Act without a replacement, to amendments of bills from 2015. This is not good governance. 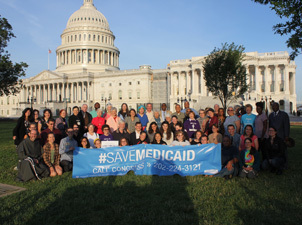 As Catholic Sisters, we stand by our belief that health is a universal right and urge Senators to vote no on the motion to proceed for any bill that would repeal the ACA and cut Medicaid. Sister Simone Campbell, SSS and other Catholic Sisters are available for interviews. For inquiries, contact Ashley Wilson awilson@networklobby.org or 202-601-7856. This entry was posted in Front Page, Healthcare on July 24, 2017 by colleen. As a former religious, I maintain a core identification with the Christian beliefs and principles expressed in Sr. Simone’s letter. Ladies you are fabulous with a shout out to Sr. Simone who may not remember me from WomanSpirit but I was touched by meeting her. Keep strong I am right there with you. God Bless the Sisters! Obviously they remain Spirit led, both listening to the voice of Jesus and following the Shepard who cares for the sheep. Making Christ visible and audible to a world that doesn’t want to see Him or hear Him. Move on up a little higher Sisters! We are with you!